In our work as your San Francisco injury law firm, we see the impact that serious injuries have on victims. We’ve all stubbed a toe and many of us have faced some form of foot pain, but these ailments pale in comparison to seriousness of a crushed foot injury. It is an injury that can result from a falling object or a pedestrian accident. When a crushed foot is the result of someone else’s negligence, our team is prepared to help the victim seek compensation for the victim. An accident detailed in the San Francisco Chronicle is the type of story that makes the reader wince. A Recology garbage truck was travelling east on Broadway around 7:30 A.M. on Wednesday. The truck made a southward turn onto the Embarcadero and hit a seven year girl and her sixty-six year old grandmother who were crossing the road. According to Officer Gordon Shyy, a police spokesman, the victims were in the crosswalk at the time of the collision. The truck crushed the foot of the young girl who was rushed to San Francisco General Hospital for surgery. Office Shyy reported that she may lose the foot or part of her leg. The grandmother suffered bruises and a leg injury but she was not run over. The accident remains under investigation. Adam Alberti, a spokesman for Recology, did not comment beyond noting that the truck involved was a combination garbage and recycling truck. Foot injuries are relatively common and, according to WebMd, one in ten broken bones occurs in the foot. 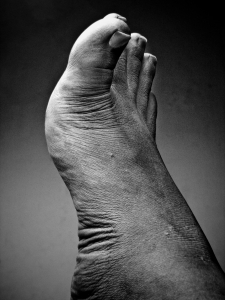 A human foot contains twenty-six bones with the majority being found in the forefoot. While a fractured toe is a relatively simple injury with a very positive outlook, crush injuries are much more complex. An article in Podiatry Today notes that crush injuries are serious and often difficult to manage. They can involve not only broken bones but also soft tissue damage. There is a risk of compartment syndrome, a condition where there is not enough blood being supplied to the area and can result in the loss of the limb. Crushed foot injuries often require emergency surgery. Long-term effects can range from weakness and pain to amputation. Patients may require rehabilitative physical therapy. Overall, victims of these injuries face pain, potentially significant lifestyle changes, and high medical costs. Medical attention should be the first priority of anyone facing a crushed foot or similar injury. When the injury is the result of someone else’s negligence, such as a pedestrian accident caused by an inattentive driver or a negligently stocked item falling from a store shelf, victims should also reach out to legal counsel. Our San Francisco personal injury law firm has experience representing victims of serious, life-changing injuries. We will work closely with your treating physicians and medical experts to ensure you receive the money needed to confront both the physical and emotional impact of your injury. Most injury cases are handled on a contingent fee basis so there is no fee unless you recover money. Call to arrange a free consultation.